Micah is such a little blessing. 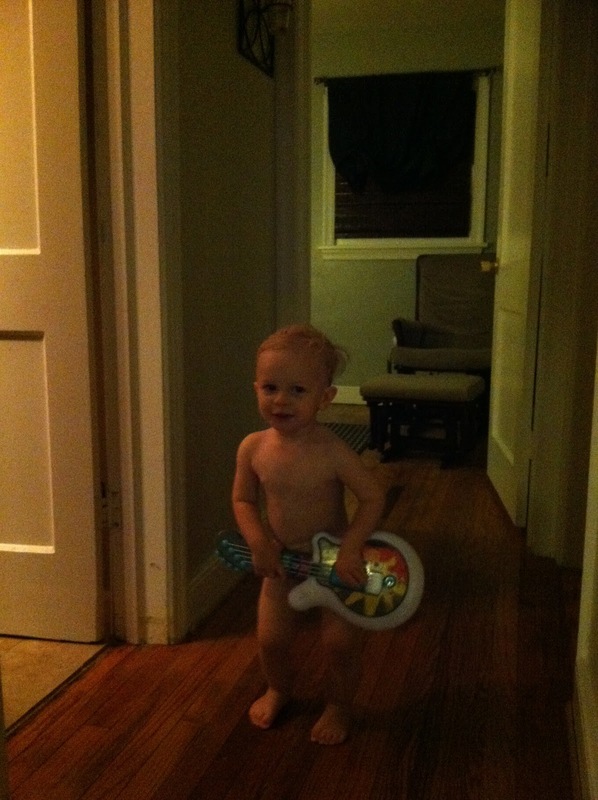 As he nears his second birthday he is becoming more and more verbal and more hilarious with each day. He is my buddy and I love his company. I just wanted to share some pictures of his most recent antics. I hope you enjoy! One afternoon Micah I could tell by the playful shouts coming from Micah's room that he was not napping. I turned on our nanny cam and saw the above image. Somehow he had taken his shirt off. The funniest part ... it was a onesie. He just slipped his arms out for some reason. What a crazy guy. 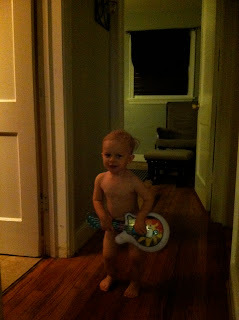 Just moments after bathtime, rockin out with a very strategically-placed guitar. Again, just after bathtime. He runs out of the bathroom stark naked and immediately grabs his lawnmower and helmet and starts running the length of our house. I was cracking up! Micah is also my sweet little helper. He loves helping me clean the bathroom. I give him his own spray bottle (of water, not cleaning solution) and a washcloth and he gets down to business! And yes, I occasionally find water sprays on other surfaces in the house but nothing that can't be wiped up quickly with a dry towel. The quick clean-ups are worth the fun/contentment he enjoys that allow me to get the tub scrubbed. My leaf raking helper. Mostly he just runs into the piles and/or removes leaves from the pile. But he loves it so much! Micah runs out of the kitchen with my hand mixer and says, "wight back, woom." I follow him a couple minutes later and discover this. "Pug it in" he says to me. And last night I offered him a cookie after his bath. He grabbed two. "Two ones?" He asked me. I was doing something in the kitchen and he excitedly came in to grab my hand. "Wook mommy! Abby, Enie eatin tooties!" I followed him into the living room and saw the above picture. He was laughing in delight at his creativity and you can bet I was too. There is no picture for this one but lately he has been pretending to go somewhere, mostly to a grandparents' homes. 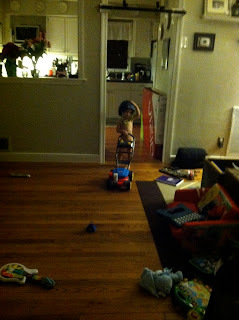 He will grab a toy and tell me "shee ya, mommy" and head to the door. The other day he noticed the door was locked and so he asked me for the keys. I really wonder how far he would go if I just let him haha! He also often checks his wrist as if looking at a watch and says, "Oh no mommy! Mimits!" (minutes) and then rushes off somewhere. Makes me smile every time. I love that little guy so much and am so blessed to be his mommy. Micah's Pappa (paternal grandfather) wrote an incredibly sweet post to his grandson this week. You can read it here. He also wrote another letter last year when Micah was about seven months old. You can read that one here. ok, that cookie/sesame street pic has me CRACKING UP! Oh my goodness, that is soooo cute! love them all, but a personal favorite is of the strategically placed toys after bathtime. I have a few doozies of my boys in similar circumstances. :) such fun! you're such a terrific mommy! I simply love how you let Micah be a boy! there is just something so wonderful about watching your son do what he does best...boy stuff! He is too funny! I love the "two ones!" haha So sweet!! He's such a good buddy to have around... for you and for all of us! What precious moments! I thought I would never forget those sweet word pronunciations and phrasings of my kids, but alas, unless I took the time to write them down or capture the few I have on video, they are sadly forgotten. You are wise to record them. It's a relief to know that you have such wonderful happiness in your life because of him, even when you have also experienced life's greatest sorrow. He is a beautiful blessing!